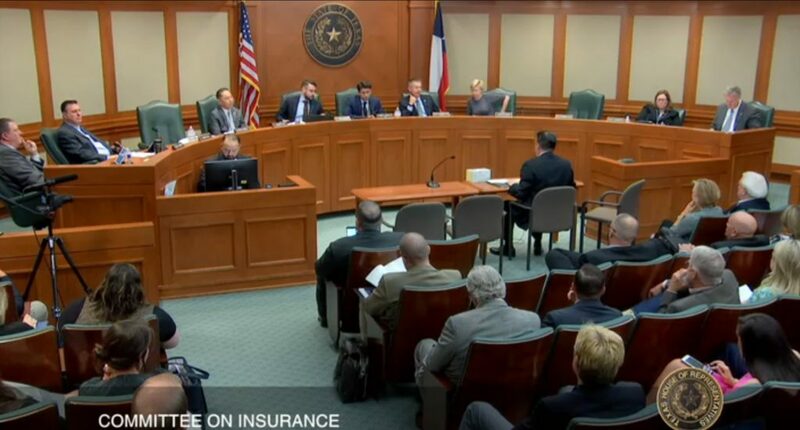 A supporter of a bill defining “like kind and quality” for aftermarket auto parts called into question two financial arguments against OEM parts in testimony before the Texas House Insurance Committee last week. Auto Body Association of Texas board member Chad Kiffe (Berli’s Body & Fine Finishes) said it’s not always the case that body shops make more money on new OEM parts, which generally cost more than third-party imitation versions of the components. “The cost margins are actually greater on aftermarket parts, typically, than they are OEM parts,” Kiffe said. He could actually make more money on aftermarket parts, he said. National Association of Mutual Insurance Companies Southwest regional Vice President Paul Martin told the committee that eliminating non-OEM parts would increase the cost of repair, meaning more cars would total. Higher repair costs also could lead to higher premiums, but Kiffe demonstrated the increase might be negligible. He said he sought quotes for insuring a late-model Lexus from three Top 10 carriers offering OEM policies: Liberty Mutual, Nationwide and Farmers. The difference in price for a Liberty Mutual policy guaranteeing OEM parts was $14, Kiffe said. Farmers charged $8.63 more, and Nationwide just $2.95, he said. We tested Liberty Mutual online Tuesday on a 2012 Honda Civic. The price difference for a policy ensuring “Damaged parts (except safety glass) are repaired or replaced with new original manufactured equipment for covered losses” was just $4.50. Kiffe described a financial disincentive for piece-rate technicians that seemed to risk repair quality. When an aftermarket part doesn’t fit, a technician can either attempt to alter the part or stop the job for a replacement part — but the latter means he won’t be paid for the second installation, according to Kiffe. This happens “quite often,” he said. “This is not the California approach,” he said. In fact, Wyoming Republican Gov. Matt Mead has approved a regulation allowing customers to have OEM parts without having to go out-of-pocket. “That’s Wyoming,” Wendell said. The Texas bill didn’t even go that far, he said. Kiffe said the bill didn’t call for only OEM parts; rather, it defined like kind and quality. Imitation parts were often made of different metals and carried different weights, and they “very seldom” matched contours and body lines, he said. “Cheap, untested parts are substituted on insurance estimates daily,” Collision & Classics President Gerald Condon told the committee. As a shop manager, he would have no problem using aftermarket parts that were certified and “proven” as identical and met the same specifications as the OEM originals, Kiffe said. Until more guidelines and restrictions on verification existed on parts companies, how could an insurer or body shop stand behind the component, he asked. Auto Body Association of Texas President Burl Richards (Burl’s Collision Center) and attorney Todd Tracy have collaborated on 40 mph moderate-overlap crash-testing of Honda Fits.. A blue 2013 Fit was repaired with aftermarket parts, including NSF- and CAPA-certified ones, while a light blue 2010 Fit was repaired with OEM parts. A 2010 black Fit with no damage or repairs was crashed as a control vehicle. Those model years are of the same design generation and functionally identical for crash-test purposes, according to the Insurance Institute for Highway Safety. “The crash test results revealed that the genuine parts performed exactly as intended to ensure passenger safety, while the previously crashed aftermarket parts-installed vehicle produced results that Tracy called ‘total and massive destruction’ in critical areas,” a 2018 news release stated. 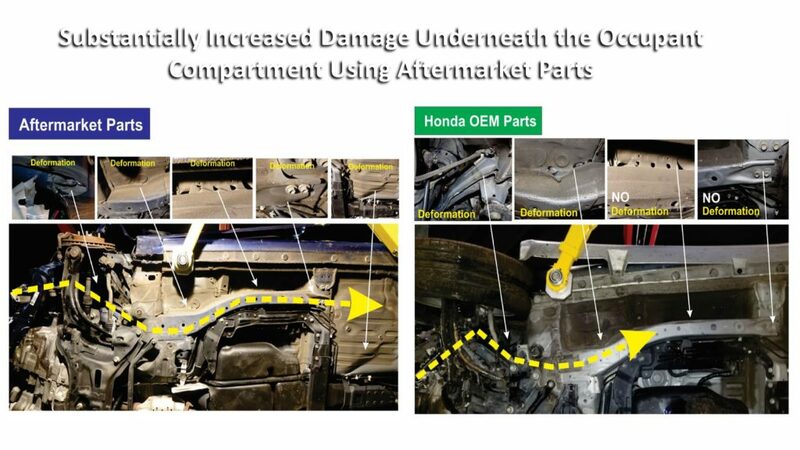 Far less deformation occurred underneath the OEM-parts Fit — similar to the crash of the “mint” OEM Fit back in 2017. Only 8 inches of passenger-side seatbelt load limiter payout was observed on the OEM parts Fit, compared to the aftermarket Fit’s 13 inches — again, mimicking the results found on the black control Fit crash. 2017 and 2018 photos of brake pedal displacement intrusion also “Demonstrate Major Floor Pan Intrusion in the Aftermarket Part Vehicle”; the OEM-parts car’s floorpan also appears similar in the image to one taken of the unaltered Fit’s floor. “We have proof,” Richards told the committee. If the parts don’t fit, “the liability’s still on us,” Richards said. LKQ central region government affairs manager Kevin Fisk told the committee aftermarket parts were made at the same facilities as OEM parts, and the only difference was a “Keystone” brand on the imitations. Wendell said there was a difference between component and whole-car testing, and aftermarket parts needed to be crash tested. Fisk described LKQ’s testing protocol. “We do our own testing,” Fisk said. He said the company randomly selects parts and tests them in relation to the OEM parts. However, “we don’t put it on vehicles,” Fisk said. He said it was “impossible” to recreate a crash over and over again and obtain the same results, even with OEM parts, and the automaker wouldn’t crash-test 100 cars either. Committee Chairman Rep. Eddie Lucio III, D-Brownsville, suggested a “basic standard” for “responsible outcomes” would be in order. Fisk said videos of aftermarket parts being tested on vehicles and faring “as well or better” as original parts were available online. Fisk also argued that the bill’s requirement that insurers reimburse OEM procedures would lead to a ban on aftermarket parts by way of those procedures requiring only original parts. Many automakers have recommended repairers refrain from using recycled, refurbished or aftermarket parts as they can’t vouch for their quality. “We know that’s where they’re going,” Fisk said. Lucio said he didn’t read the bill that way, but Fisk said legislation in multiple states had not yet found “the fix” calling for OEM procedures without allowing OEM procedures to ban aftermarket parts. 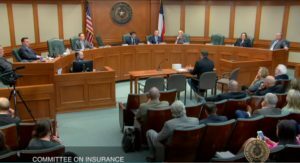 American Property Casualty Insurance Association state government relations Vice President Joe Woods opposed the bill and raised a similar point as Fisk. He suggested the bill would be more palatable if it instead restricted parts to those certified by CAPA. “That would be some help on this bill,” he said. Fellow bill opponent Auto Care Association state affairs director Tom Tucker also brought up CAPA, declaring it to have certified “most” aftermarket parts. Automakers also recall parts “all the time,” so “both have problems,” Tucker said.